Trucks are BIG in this household. Trains are big too – but there are so many DIFFERENT kinds of trucks that they slowly seem to be taking over! 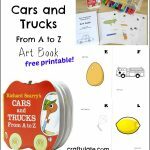 We have some fantastic truck books that I wanted to share with you. 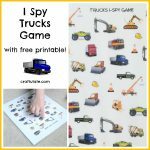 This cute and fun story is about a Little Blue Truck that helps a big dump truck. There is another book in the series: Little Blue Truck Leads the Way which we also like. This book is part of the excellent Amazing Machines series, and is a wonderful mix of fun, rhyme and information. This is a whacky little book featuring real and imaginary cars and trucks. 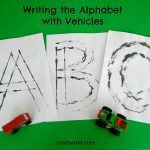 Let’s just say that the first four pages run like this: “Ambulance, apple car, bananamobile, bugdozer, corn car, crayon car, delivery van, dump truck…” We also have a printable Art Book to go with this book! This popular book is a lovely gentle read. It features the vehicles on a construction site all finishing work for the day and going to sleep. This book can be hard to get hold of – but buy it if you find a copy! A little boy pretends to be different construction site vehicles, including riding on his Daddy’s back as if it was a flatbed truck. Probably MY favourite trucks book! It is very interactive with lots of moveable parts that are great quality and will last us a long time. In the same series as Tough Trucks – this is another very successful book in terms of conveying information in a fun style. This book features bright bold photos and is a wonderful visual guide to trucks. These fun books have moveable wheels so the books can be rolled around! Bright and engaging photos throughout. 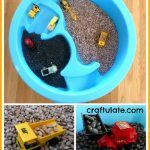 A fun story about two dogs driving a dump truck that gets stuck, and the people they ask to help them. Good rhymes and fun illustrations. I hope you enjoyed our truck book selection! If we’ve missed any of your favourites please leave me a comment and I’ll check it out! 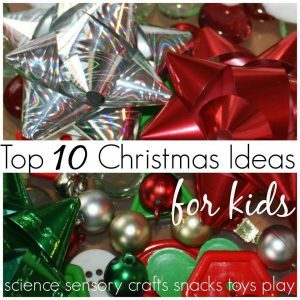 This post is part of the “Top 10” series – check out the rest of the Christmas ideas from my co-hosts! My girls love when I read them books! And they can be about trucks too!